Hi PJ! Hi Romance Dishers! Back for another episode of On the Road with Anna Campbell. 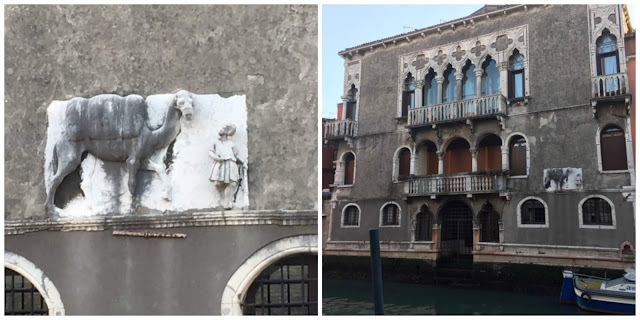 We last left our intrepid heroine halfway through her three weeks in Venice (you can read my first OTR post for 2019 here: https://www.theromancedish.com/2019/02/ ). Our intrepid heroine was actually a bit of a naughty girl for those last 10 days or so in Italy. She was in town supposedly to edit The Highlander’s Lost Lady which is out at the end of April. But with the lure of so many beautiful places outside, she ended up being out more often than she was in. On the upside, she got some very nice photos! As you can see, the weather continued glorious. It was even warm enough to sit outside and eat in the open air, which I certainly hadn’t expected to do in February. I walked for miles and got lost over and over. As PJ will tell you, that’s part of the fun of being in Venice. I did a couple of museums, the Peggy Guggenheim Collection (http://www.guggenheim-venice.it/inglese/collections/index.html )which is full of wonderful modern art, and the Ca D’Oro (http://www.cadoro.org/?lang=en) which is full of medieval and renaissance pieces in the most spectacular palazzo. The picture of the Grand Canal from the colonnaded landing was taken from there. I also caught up with a couple of friends and had a (very short) gondola ride across the Grand Canal. One of the highlights was a visit to the terrace of the Fondaco dei Tedeschi (https://www.dfs.com/en/venice/t-fondaco-rooftop-terrace) with its panoramic views right across La Serenissima. You really do feel on top of the world there. If you’re planning a trip to Venice, I’d highly recommend doing this. It’s free but you have to book – they only give you 15 minutes up there! 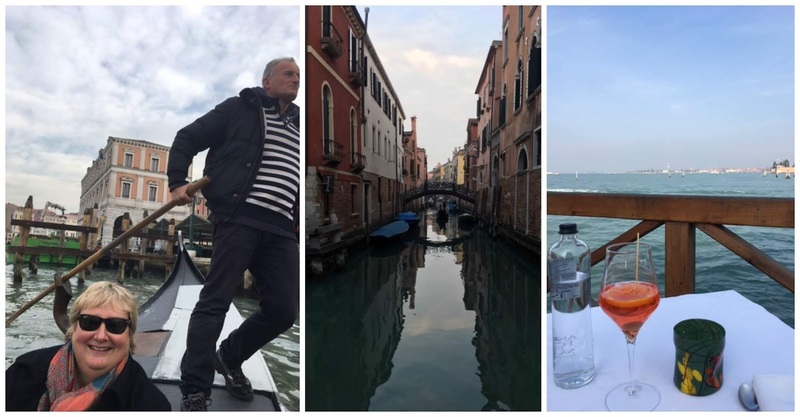 The two pictures with the one of me in the gondola are from my last day in this beautiful city and are in the way of a promise to myself that I’ll get back there before too long. I shouted myself a rather extravagant lunch at a beautiful restaurant called Algiubaggio di Antonello. The moody picture next to it was my last shot from my last walk around the canals. Venice continued to come up trumps for me the next day when I scored an upgrade on both legs of my flight to Dublin. This was just a quick visit to the fascinating capital of Ireland – I did a tour of Kilmainham Jail (http://kilmainhamgaolmuseum.ie/ )which has a tragic and dramatic history of convicts transported to Australia and the imprisonment of the heroes of the 1916 uprising, had a haircut, and did a lovely drive with a friend of mine, romance writer Abby Green (https://abby-green.com/), along the gorgeous sea coast not far from the city. The photo at the top of this column gives you an idea of both the scenery and the new coiffure! Since then I’ve been settled in the lap of luxury at the Tyrone Guthrie Centre (http://www.tyroneguthrie.ie/) in Annaghmakerrig in Country Monaghan, up near the Northern Irish border. Because of my lack of achievement in Venice, I’ve had my head down but not so down that I haven’t taken a few nice photos in this gorgeous environment. Tyrone Guthrie was an internationally renowned director, producer and writer from the 1920s through to the 1960s. After his death, he bequeathed his beautiful family estate to the Irish nation as a retreat for artists. I’ve been meeting the most amazing people here, painters and dancers and theatre types, and a whole stack of writers. Ireland seems to grow writers the way my lawn grows dandelions! I feel very lucky to be here. I’m in the late Lady Guthrie’s room – which is definitely feeding into my fantasies of being the lady of the manor! Look at that lovely view from my desk out over the lake. If you look at the photo of the house, my room is upstairs on the far right-hand side above the main entrance. Very la-di-dah! The other pictures are from my walks along the lake where I go when I need to clear my head after spending all that time steaming up Scotland with my hero and heroine! Check back next month for the next lot of adventures. I’ve got another two weeks here in Ireland, then I’m heading to Scotland. I’m visiting a new island, Bute, and also returning to the beautiful Isle of Eigg which many of you will remember from last year’s posts. I’m finishing up with a photo that makes me smile. The day I went to Peggy Guggenheim, I walked for miles. It turns out Google maps are unreliable (to say the least!) amidst the twists and turns of Venice. Starving and dead tired, I stumbled into a restaurant called the Trattoria ai Cugnai. Very old and atmospheric and traditional, as you can see. And it turns out, the gondoliers’ choice for where to have lunch. I suspected I was in good hands—and I was. 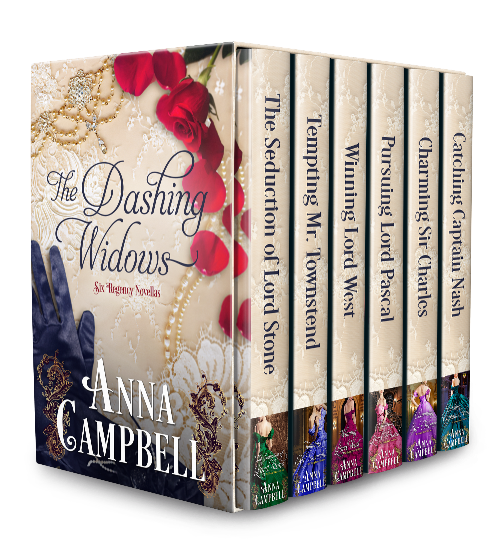 I’ve got a download of the bestselling boxed set of my Dashing Widows stories to go to someone today. No geographical restrictions. Tell me about your favorite restaurant/café to be in the draw. Good luck and see you next month! There's a local restaurant here on the river that's just perfect to enjoy a beer and pub food watching the boats go by! Oh, that sounds lovely, Linda. Where are you? About an hour west of Chicago in rural Illinois . Oh, lovely, Linda. Always wanted to visit Chicago. One day! The pictures are wonderful Anna. Thank you for sharing. When my daughter spent a week in Ireland her pictures were gorgeous. Everything was such a brilliant green. She said it was even more beautiful in person. We have a lot of small Austria's and mom & pop style restaurants in our area here of New Jersey. But there is a beautiful establishment called The Major up on the mountain. They host weddings, parties and dining . It really is beautiful with all it's chandeliers. Very nice and everything I've ever eaten there has been delicious. Hi Carol! Thanks so much for swinging by. The Major sounds just lovely! So glad you're enjoying the pictures. When I left Australia, we were in the grip of a dreadful drought so the green here in Ireland is burning my eyes, it's so vivid! Please don't count me in for the drawing. Thanks for swinging by. Glad you're enjoying the pics! Hiya, Anna! I also enjoy your travel blogs. You have such interesting stories and beautiful pictures. I love Venice, but I was only there for 2 days. I saw the highlights only, but they were wonderful. I spent several days in Ireland, and I long to return. Something about that country just speaks to me. I do have Irish ancestry, so maybe it is in my blood to be drawn to Ireland. I have eaten at a lot of wonderful restaurants, but one favorite that comes to mind is one in Baltimore. It was on the waterfront, and we had the most delicious crab cakes that we have ever eaten. Cheryl, lovely to see you. Thanks for saying you enjoy the posts. I certainly enjoy putting them together. I'd only been to Venice for short periods too (twice before). It was absolutely lovely having nearly 3 weeks to settle into a real routine. Ireland is just magical. Kicking myself I waited so long to come. I love crab cakes. They're not something you see very often in Australia but I've had them often in the States. Loved your pictures! I've never been to Venice, nor to Scotland so I am living vicariously through you! My favorite restaurant is a local Italian place near me. I love Italian food. Amy, I love Italian food too. It's always so tasty! It was lovely being in Venice for 3 weeks and getting to try a lot of the local produce. Yum. So glad you're enjoying the pics! I'm loving all of your pics and reading about your adventures. Lucky you to get to visit so many lovely places. Thanks, Diane. I had a carpe diem conversation with myself a couple of years ago. I love your pictures and I also enjoyed visiting Venice. I've never been to Ireland but it looks beautiful, too. I don't really have a favorite restaurant/cafe, unless you count the restaurant on the cruise ship I "live" on. Thanks for the chance to win. Michele, a restaurant on a cruise ship sounds very exotic! Ireland is just gorgeous - they don't call it the Emerald Isle for nothing. To someone from drought-stricken Australia, that green is miraculous! Oh, that is a tough one to answer. I will have to go with Papa Haydn, a fine dining restaurant in Portland, Oregon. The food was fabulous and the desserts are incredible. It had a neighborhood feel to it and the patrons were mostly dressed casually but with some people dressed more elegantly, perhaps dropping in for coffee and dessert after a play. Lil, that sounds like a great place! A few people have told me Portland is a really wonderful place to visit. I'll make a note of PH and visit if ever I get there. The last time I was in Italy we had lunch at the Ristorante Pizzeria San Giovanni near Ravello. Their outdoor seating offered stunning views of the Mediterranean and the Lemon Risotto (made with lemons from the family's groves) was one of the most delicious dishes I've ever tasted. I could have happily dined on Caprese Salad and that divine Lemon Risotto the entire time I was in Italy. PJ, what an evocative description, I can almost smell the salty breezes from the Mediterranean. And that risotto sounds divine! One of the things I love about Italian cuisine is that often the ingredients are simple but because they're excellent quality, the meals are really fabulous. Hi Anna, Love seeing your pictures. Glad you are taking all of us on your journey with you! There is a little place called The Side Porch. The food is always amazing! Pamela, where is the Side Porch? Love that name! And thanks for saying you're enjoying the traveller's tales! I love your pictures - and with your descriptions, you make it all sound so lovely. Thank you! My favorite restaurant - maybe 2 or 3: A local Tex-Mex - Maudie's, A local Chinese - The Rice Bowl and a local Hamburger Joint - Top Notch. No fine dining, but I am giving you the places I seem to go most often. Thanks again for your pictures - Bellissimo! Annette, what a great list of places! I really like Asian food - we get a lot of it in Australia and good quality too. And thanks for saying you're enjoying the pics! I love your pictures and descriptions!! I wanted to share that I live in Minnesota where Tyrone Guthrie was a director and where we have a theatre named for him. The Guthrie is world renown and features actors and actresses from around the world. I'm not sure I really have a favorite restaurant. I just enjoy the company I'm with when I'm eating out. Eileen, while I've been here, I was curious about the man responsible for this marvellous place and I read both his autobiography and his letters. He talks a lot about the Minnesota Theatre in both of them. How lucky you are to have that theatre so close to you! Fedora, I eat out much less than I used to - in my 30s, I seems to always be at restaurants. I must say I still love have a nice dinner out with friends. There's something just so convivial about the whole vibe. I've never had Peruvian cuisine. What is it like? I think it can vary, but we had some delicious dishes including specially roasted potatoes, beef hearts, and some other dishes that shared some similarities to Mexican dishes we've tried, including ceviche and arepas. We're thankful our kids have pretty varied tastes and are open to exploring when we eat out too! Fedora, always easier when the kids are willing to try something different! I have enjoyed watching your travels on Facebook. I loved a restaurant called Air Transport Command which was designed to look like a farmhouse in WWII near an airport. Not sure if it's still around. Had the best cheesecake. Denise, that restaurant sounds really quirky! Thanks for checking out the post. Thanks to everyone who swung by. The winner of the boxed set has been announced and it's Linda Watson. Congratulations, Linda. See you guys next month when I'll have lots of Scottish pictures to delight you! Thanks for hosting me, PJ.